While we do our best to cover all things Boulder, we know there are some niches and information we haven’t yet covered. 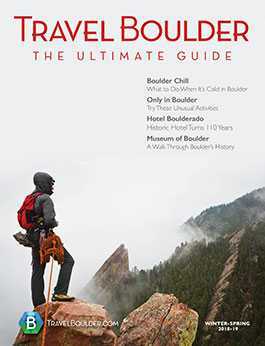 Check out these other Boulder resources for more information on Boulder news, events, venues and Colorado in general. Colorado.com offers information about all things Colorado. Get special deals for Colorado.com visitors on activities, attractions, dining, accommodations, shopping and transportation. Explore stuff to do, unique events, places to stay, regional information and more! Over the years The Daily Camera has woven Boulder and Broomfield counties issues, events, politics and human stories into the fabric of their pages. Their mission is the same today as it’s always been: To deliver essential, informed and relevant news to our readers. The Colorado Chautauqua Association is a nonprofit that leases 26 acres, the Auditorium, Dining Hall and Academic Hall from the City of Boulder. CCA provides lodging, programming and venues for private events in the historic Chautauqua buildings and grounds. The mission of the Boulder Convention and Visitors Bureau is to advocate and provide leadership to develop and promote the natural environment, art/culture, historic and visitor potential for aiding the Boulder economy. Boulder County Parks and Open Spaces MISSION…to conserve natural, cultural and agricultural resources and provide public uses that reflect sound resource management and community values. The nonprofit Boulder Chamber is the region’s flagship business advocacy and support organization. Together with its member businesses, the Boulder Chamber is building a smarter, more vibrant economy. Have questions or want to see a specific resource listed here? Let us know! Contact us at [email protected]. We will review your request and add it if we think it will be useful for our visitors.